"This, then, is how you should pray: ‘Our Father in heaven, hallowed be your name, your kingdom come, your will be done, on earth as it is in heaven. Give us today our daily bread. And forgive us our debts, as we also have forgiven our debtors. And lead us not into temptation, but deliver us from the evil one.'" Matthew 6:9-13 (Camp memory verse). Empower a Child’s very first camp and “Fun Day” were both extremely successful events thanks to our generous supporters and sponsors. 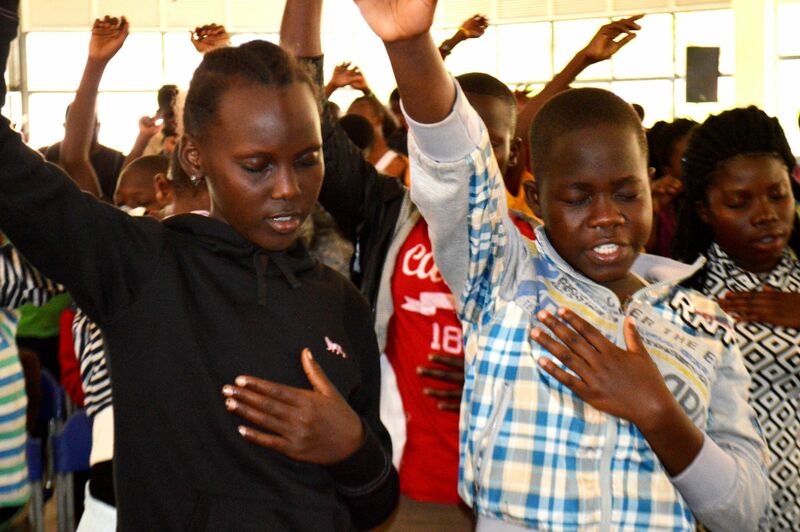 Over 500 sponsored kids in both Kenya and Uganda attended the events and learned about the theme, God as "Our Father" and "Destiny." The kids enjoyed having the opportunity to hang-out with others their own age while the themes were incorporated throughout all the fun activities. The Fun Day, held in January at a local park, was a great opportunity for our sponsored children under ten years old who could not stay overnight, to still experience God, excitement, and friendship. 90 children were blessed with admission to the park, a T-shirt and a day full of worship, food, lessons, stories, and plenty of games. For many of the children, it was their first time to play in a park or playground so they enjoyed the swings, slides, train rides and the fish pond. In line with our theme, the kids were taught a relatable lesson about God, our Father. For the older kids and youth, Empower a Child hosted a week long camp in Kenya in December and Uganda in January. For many who came, this was their very first time away from home. The team did their best to ensure the kids felt supported and safe in the new environment. The children and teens enjoyed a week of worship, food, sports, and many great teachings. Important topics like God’s love for them, forgiveness, appropriate use of social media, and their reason and purpose were discussed, provoking some valuable discussion and questions for the team. To end the last night of camp, the kids had a talent show and bonfire before bed. During the talent show, the students sang, danced, and put on skits they created in line with the theme. The competition was tough and the pressure was high, but it’s certainly safe to say the heavens heard our kids that night! The camps were a fantastic way of bringing the kids together during the school holidays while learning about God as their Father, but the most important part was that over 100 of the kids gave their lives to Christ while at camp. God is so good! Planning is already underway for Empower a Child’s 2019 Camp. We would love to have a strong team of volunteers present, so if you are interested in coming to help as a facilitator, technical support, counselor, logistics, sports, or any other area, email Ashley ashley@empowerachild.org expressing your interest. Your prayers in leading up to this event are greatly appreciated. We want these camps to really bless these kids! Click here to watch a short summary of the week!